A month long residency based at the Casa dell’ Ospitalita di Venezia (CDOV), a homeless hostel in the Cannaregio district of Venice. Bella has been invited to undertake a month long residency in Venice by Mission Gallery Swansea, in partnership with CDOV and supported by Swansea College of Art, UWTSD. This will assist the development of her practice and part of the support that Mission Gallery offers artists at all stages of their careers, particularly those who wish to establish their work and profile on an international level. This will be informed by and exist alongside a continuation of CIVIC manifestations in cities across the globe. Drawing and making will be planned as a daily activity, with the option to include CDOV residents. The aim will be to explore the basics of mark making, form and expression. There is a possibility that outcomes will be ‘translated’ through manufacture and these artefacts will be manufactured pre-residency and taken to Venice. Others will be made in Venice, and drawings and objects brought back for another phase of manufacture in Wales. “This residency has already pushed my practice and thinking forward, due to a clearly defined pre-residency period during which I have had use of Mission Gallery’s Jane Phillips Award residency space at Elysium Artspace and negotiated funding with UWTSD and the opportunity to cast objects at Carmarthen School of Art at Coleg Sir Gar and learn about casting processes. The objects will be part of a series that is growing day by day, as it will continue to do in Venice. The objects are both found and made, and all are small enough to be held in the palm of the hand. The ‘found objects’ range from the ‘worthless’ to ‘antiquities’ – my father’s matchboxes and two Roman rings unearthed in Bath; things that I use each day, such as pencils – or throw away, such as plastic spoons and containers. The ‘made objects’ are ‘hand crafted’ in paper, cardboard, and clay, stitched or cast in metal, or (re)made by others. 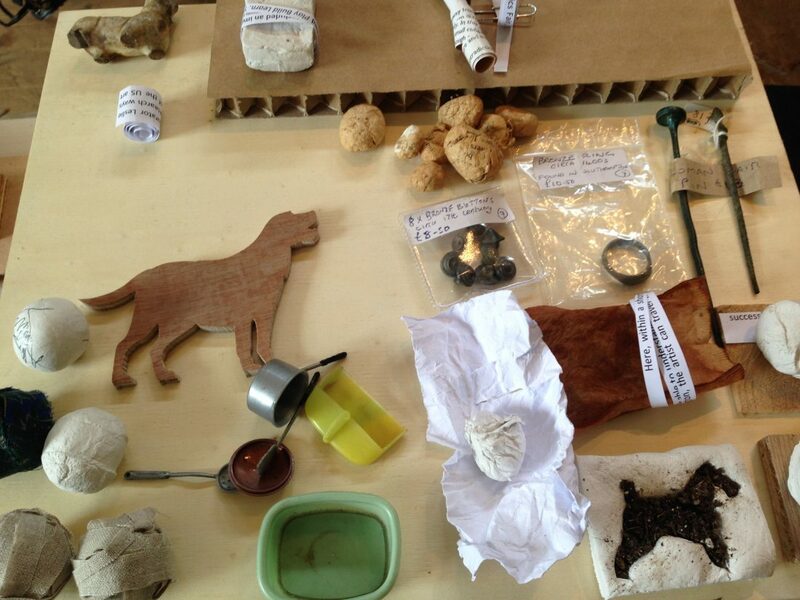 As part of the visits to producers in Venice, I will hope to make, or have made, objects. For example, letterpress cards printed in English and/or Italian. Furniture is a key element of CIVIC and for the visits and other conversations I will have ‘facilitating’ furniture – if we have a table and two chairs we can talk. The design for the table will be extended to supply the exhibition furniture for the closing event. I will work on ideas before and during the residency towards a system that can create narrow, ‘bridge-like’ cardboard tables that can be arranged to create surfaces for the display of the small objects”.